My youngest guy wanted to make a simple DIY Catapult using things that we had around the house. I thought it was a great idea and told him to go ahead and show me what he could come up with. Of course, the boy loves a challenge so he was all in and ready to impress. He literally used three items that I never would have guessed would work together so well, but they did!! We tried launching paper and marshmallows and lots of little harmless things. Let’s be honest, we had to try this thing out with something fun. Maybe it was cookies, that we tried to get into our cup of milk. You would not believe how hard that actually is to do, but it’s really fun trying. Make sure you have a large space and that you’re ok with cookie crumbs getting everywhere!! I’d love to say that we got the cookie in the milk, but sadly we did not. That doesn’t mean we didn’t give it our best effort though!! 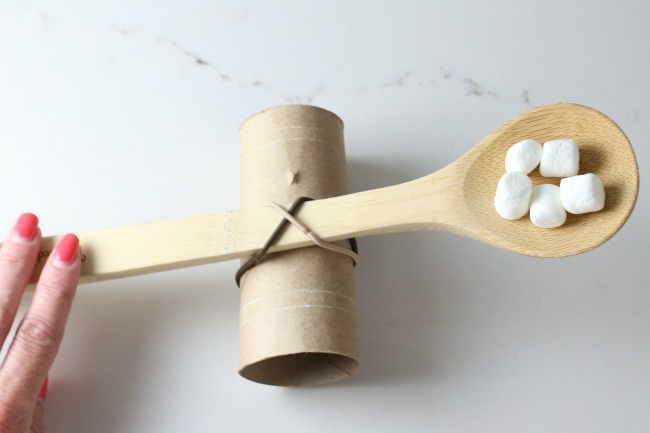 Use the elastic bands to cross and hold the wooden spoon on the toilet paper roll. Place the spoon so that the handle is in the air and the other end is touching the table, that way you can hit the handle to launch your item. This is one of those projects that your kids will spend hours doing because it’s pretty cool to be able to launch things across the room! My son got a little bit crazy and hit the ceiling a few times, so be sure to supervise if you’re worried about that! What types of easy crafts do you do with your kids? Do you make things out of items you have laying around the house and let them have fun with their imagination? Previous Post: « 5 Inspired Ideas to Make Toast Fun to Eat! fun crafts but you really should not be encouraging the use of toilet paper rolls for crafts. think about what they are used for and where they are located in your home. now picture your child playing with it. In childcare we have banned the use of them for crafts. Instead use a paper towel roll cut in two. If you are looking for making the best things with the things around you can be prepared with the help of these innovative ideas mentioned in this post.